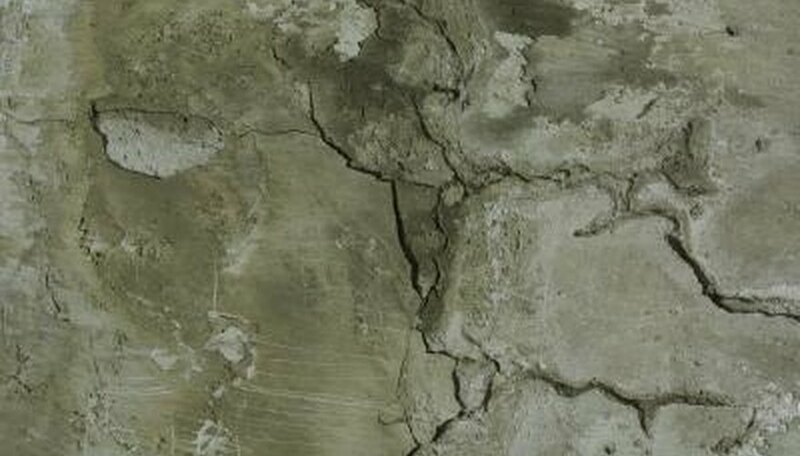 Concrete garage floors are susceptible to extreme temperature changes and erosion due to regular wear and tear. Areas in which homeowners use de-icing salts to melt snow and ice from driveways will eventually cause the concrete garage surface to spall, or flake, from vehicle tires bringing the de-icing salts inside off the driveway and road. You can easily repair this spalling condition by resurfacing the concrete. Resurfacing the concrete will add a thin layer of concrete, referred to as an overlay, to the garage floor to create a smooth surface. Clear the garage floor of equipment, workbenches and any tall tool chests that will get in the way of repairing the spalled concrete. Remove dirt, loose debris and flaking sections of concrete with an industrial-strength, 3,500-psi pressure washer, starting from the farthest corner of the garage and working your way out. The high intensity flow of water from the pressure washer will remove any weak sections of concrete from the garage. The surface of the concrete garage must be clean and free from oil and dirt before you apply the concrete bonding agent. Cover any expansion joints within the surface of the concrete garage with duct tape. The tape will prevent the concrete bonding agent and resurfacer mix from flowing into these joints. Create a wooden barrier at the opening of the garage floor with wooden boards. Spray the sides facing the garage with vegetable oil spray so you can remove the boards easily. This barrier will prevent the concrete resurfacer mix from flowing out of the garage. Keep the wooden boards from moving out of place by weighting them down with heavy objects. Spread a thin and even coating of concrete bonding agent using a long-handled paint roller. Begin applying the bonding agent in the farthest corner of the garage. For edges and corners of the garage floor, use a small paintbrush to apply the bonding agent. Pour concrete resurfacer mix into a 5-gallon bucket. Read the manufacturer instructions on the ratio of water to add to the mix. Mix the resurfacer mix with the stated amount of water using a paddle mixer attached to a power drill. Continue to mix the resurfacer until it is lump-free and resembles pancake batter in consistency. Empty the 5-gallon bucket onto the garage floor, and use a long-handled squeegee to spread the concrete resurfacer to cover the surface of the garage. Allow the concrete resurfacer to dry for 24 to 48 hours. Remove the wooden barrier and duct tape covering the expansion joints when the concrete resurfacer is dry. An ideal day to repair the spalled garage floor is when outside temperatures are between 50 and 60 degrees Fahrenheit and the sky is overcast. For a textured, non-slip garage surface, run a broom over the concrete resurfacer before it dries.